Calls for immediate repairs to a busy link road into Portadown have been made by the DUP. Candidate Lavelle McIlwrath called on the Department for Infrastructure to urgently look at the condition of sections of the Mullahead Road, Tandragee and take immediate action to rectify some of the worse parts of the road. Mr McIlwrath said ‘Mullahead Road is a major link road between Portadown/Lurgan and the wider Tandragee area and thousands of vehicles use this busy route every single day. “Some sections of the road are in extremely poor condition and need urgent attention. 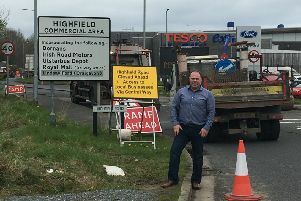 Mr McIlwrath said: “I have raised the issue of the condition of Mullahead Road directly with DfI Roads and urged them to look at this busy arterial route with a view to carrying out the necessary resurfacing on the worst sections of the road.